Seneca’s Thyestes is possibly one of the most disturbing plays in ancient literature. True to Senecan style, there is very little action, but the description is very vivid. It crush my brother too. Quivering, veins still throbbing, shocked hearts beating. In the internal organs hot with blood. Last week I talked about Tantalus, and the curse on his descendants. I mentioned his son Pelops, poor kid who was fed to the Gods and now missing a shoulder. Well, Pelops himself turned out to be less than pious (someday, I will talk about the Roman notion of piety ie. very different from Christian piety). So, Pelops grows up and wants to marry Hippodamia. Hippodamia’s father had heard a prophecy that his son in law would kill him. Therefore, he had of course killed all of Hippodamia’s other suitors. 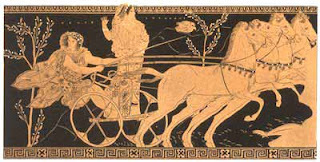 Pelops has to defeat the father to win his bride, so he promises the father’s chariot driver half the kingdom and the first night in bed with Hippodamia. The charioteer replaces the pins in the chariot wheels with beeswax and Hippodamia’s father dies in the race, so Pelops can marry her. He then rescinds his promise to the charioteer, and throws him off the cliff. The charioteer curses Pelops as he dies. This is the curse that ruins Pelop’s sons. Pelops and Hippodamia have three sons, Thyestes, Atreus and Chrysippus. Thyestes and Atreus conspire together to kill Chrysippus for the throne. Pelops exiles them, and they end up in Mycenae. They pretty much just usurp the throne, splitting the power. Atreus finds a golden lamb in his herd, which by all rights he should sacrafice to the Gods. But instead he gives it to his wife Aerope to hide from the Gods. Aerope then gives the lamb to her lover, Thyestes. Thyestes convinces Atreus to agree that whoever possesses the golden lamb should have sole rule in Mycenae. Then he produces the lamb, making Aerope’s adultery clear. Atreus eventually wins his way back into joint kingship with his brother, but he’s still bitter about the adultery thing. And, you know, wants the power to himself. So he plots to kill Thyestes’ children and feed them to him (sound familiar?) He spends the night getting Thyestes drunk and talking about their reconciliation. Thyestes consumes a feast made from the flesh of his sons. What agitation in my stomach swells? That is not mine is groaning. O my children! Where are you? Come! Your ailing father calls you. Will soon be ended. Do I hear them? Where? Embrace your children, father! They are here. Beside you. Do you recognize your sons? Atreus’ sons are Agamemnon and Menelaus, Thyestes’ son (the one who wasn’t eaten) is Aegisthus. More on them next week! Pelops gives his name to the entire Peloponnese.Much later, the Spartans claim to be descended from Pelops and therefore hegemony in the Peloponnese.